Standard Mark 1 G.I. Assault Rifle (with inbuilt targeting system and infra-red low-light sight and biochip-compatible). Frag grenades. Intramuscular polycarbon armour (bullet-proof skin), hardened "Super Axon" central nervous system (ehancing reflexes), advanced "self-scrubbing" respiratory system immune to all forms of chemical attack, nictitating "third eyelid" membrane. A lone wolf, Venus wanders the war-ravaged surface of Nu Earth, occasionally working for hire or trading her skills for supplies and transport; thereby fulfilling the dictates of her genetically-enhanced D.N.A. - to fight! 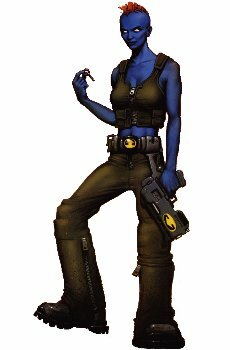 Venus has worked alongside the original Rogue Trooper and Friday, last of the Mark 2 G.I.s. Together with the first Rogue and his team of G.I.s, Venus was responsible for bringing in Friday for the Nort/Souther Coalition. After the disastrous storming of the Scavenger of Souls' satellite (during which the original G.I.s were killed), she stayed with Friday, developing a near-human affection for him. However, before their meeting Venus was already the veteran of many a solo mission . . .